Eight essential skin benefits. One simple step to flawless. 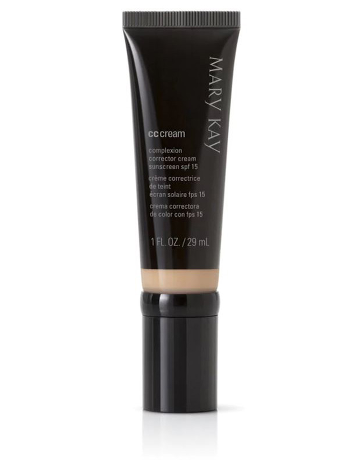 Mary Kay® CC Cream Sunscreen SPF 15 acts like makeup to instantly correct complexion imperfections while formulated like skin care to help nurture skin’s beauty tomorrow. So remarkably lightweight, you’ll look naturally flawless as if wearing nothing at all. From instant brightening to protection against future damage, hours of hydration to diminishing the look of blemishes and redness, this silky formula leaves skin looking healthier, younger and more vibrant. It’s a can’t-miss if foundation is more coverage than you need, or if you want an easy, out-the-door option without that “made-up” look. Suitable for all skin tones, skin types, and acne-prone and sensitive skin. Oil-free, fragrance-free, non-comedogenic, dermatologist-tested and tested for skin irritancy and allergy. Use fingertips to apply CC cream to your face as if it were a moisturizer. Wait a minute to absorb, then apply your foundation formula. Niacinamide and ascorbyl glucosideare known to help skin’s tone look more even and brighten the look of skin. Vitamin E and a botanical extract extract help calm and soothe skin. Powerful antioxidants including vitamin E and silymarin extract, help defend against skin-damaging free radicals. Suitable for and tested on Asian skin. Formulated with a SPF 15* to protect from damaging UVA and UVB rays that can contribute to the visible signs of premature skin aging. Provides visible relief and minimizes the appearance of skin redness. It’s formulated with vitamin E and a botanical extract to help calm and soothe skin. Mary Kay® CC Cream Sunscreen SPF 15* was even tested on women with rosacea who agreed that it helps diminish the look of redness. Women are seeing amazing results! *†Results reflect the percentage of women who agreed with the statements in a two-week independent consumer study.